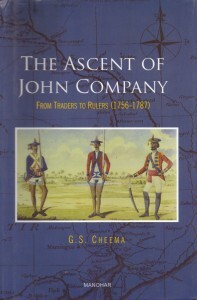 Review of The Ascent of John Company: From Traders to Rulers (1756-1787) By G S Cheema. They came to India — that fabled land of riches. They were paid a pittance — £ 200 a year for Governor, and £ 5 per annum for Writer, the position that Robert Clive and Warren Hastings first occupied when they came to India. They had sailed in search of a fortune that they could plunder. The Company had bought from the British Emperor a charter that allowed them exclusive trading rights, and now they would extract what they could. Naturally, the formative years were tough on them. Some of the servants of the Company were incompetent, most were corrupt and all undertook the trip at great peril—the fatality rate at that time was 80 per cent! The Mughal Empire was in decay and thus the British found it possible to negotiate with the governor. When it was someone like Siraj-ud-Daulah, it could be difficult, as the British discovered when they riled him. Siraj responded with a massive attack on Fort William, driving the vastly outnumbered Company soldiers and English officers out of the fort. Governor Drake managed to get reinforcements, and the next time they engaged with each other, the Company forces emerged winners, and a short time later Nawab Siraj ud-Daulah was killed at the hands of his compatriots, which included Mir Jafar, having ruled for barely 15 months. Life was nasty, brutish and short and laws, honour and loyalty had become meaningless. Everyone lived for the moment. Disorganisation and disunity in the Mughal ranks during the period is a theme we are familiar with. The corruption, avarice and Machiavellian manipulations of Company officials make for a horrifying yet fascinating reading. There were battles for spoils, disaffection among even British officers, internecine struggles for supremacy…. Company armies faced mutinies in Bengal in 1764. Besides British, there were French, Dutch and German officers in various companies, and the trouble arose, as it often does in mercenary forces, over the distribution of promised bounty. Good fortune, strict action and executions had a salutatory effect. Robert Clive, by then the governor-general and the commander-in-chief, faced a conspiracy among his officers too, but he was able to put it down and punish the guilty. Clive’s successor Hastings became, in 1774, the first governor-general of Calcutta. He set in motion several administrative reforms, and cracked down successfully on bandits. However, his tenure was marred by the Bengal Famine, the ‘judicial murder of Maharaj Nand Kumar’ and the intrigues around Munny and Babboo begums. Hastings was later to be impeached in the House of Commons. He was accused by Edmund Burke, an MP, on 20 counts. Seven long and expensive years later, the House of Lords acquitted him. Law and justice, which many nowadays thank the British for, started on an importune note. Sir Elijah Impey, the first Chief Justice of the Supreme Court of Judicature at Fort William in Bengal, was tainted by his trial of Maharaj Nand Kumar. “His intimacy with Warren Hastings, a friend since their school days, made him a prime target for the enemies of the Governor-General, and their pressure for investigation of a number of controversial episodes during his career in India led to his recall in 1783.” There was an attempt to impeach him in the House of Commons, but it was thwarted. His legal career was, however, derailed. He was elected MP later. Through this book we meet these colourful, even scandalous, characters. What they did affects our lives. Cheema is a serious author who uses humour with telling effect. Given its size, price and subject, everyone may not read this book. Those who do, will be richly rewarded.